‘She Draws I thread’ is a collaboration between me and my five year old daughter, Miya. She draws, and I embroider. Miya loves telling stories through her drawings and I wanted to preserve this beyond leaves of paper that can end up as clutter. 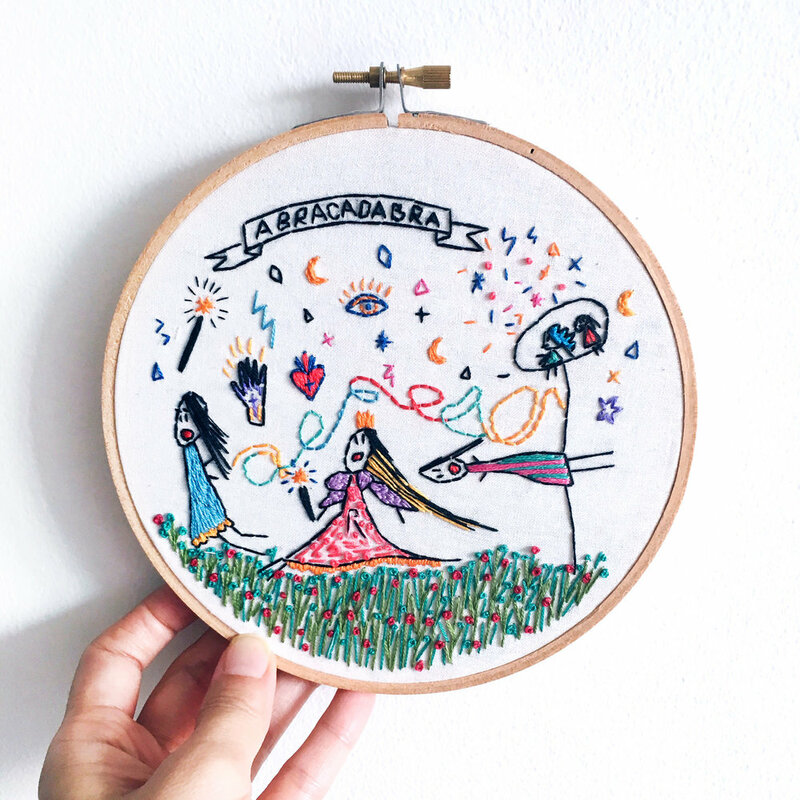 Embroidering her drawings and stories helpS me immortalise these precious moments. Have a drawing or a child’s art that you want to keep forever? 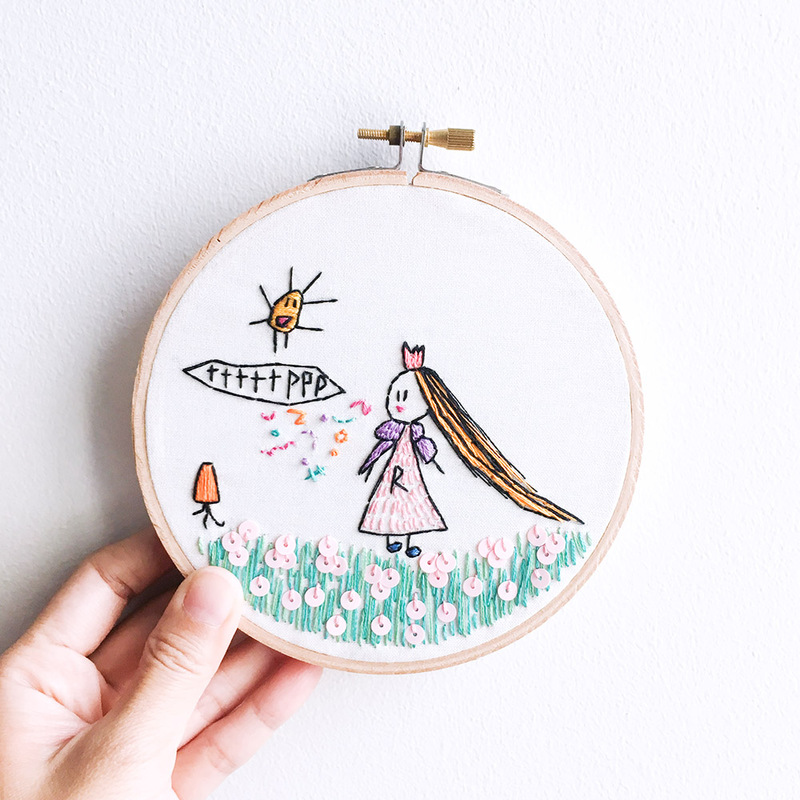 I’ll turn doodles on paper into something special through needle and thread. To order, drop me a request at Commissions. Please also check out the FAQ page for artwork limitations and commission lead times. Miya brings me so much joy. She is unwaveringly kind, loving and adventurous. She loves drawing and I love listening to her stories. We crack silly jokes about her drawings and musings. Her mind astounds me – always filled with creative, imagination and wonder. 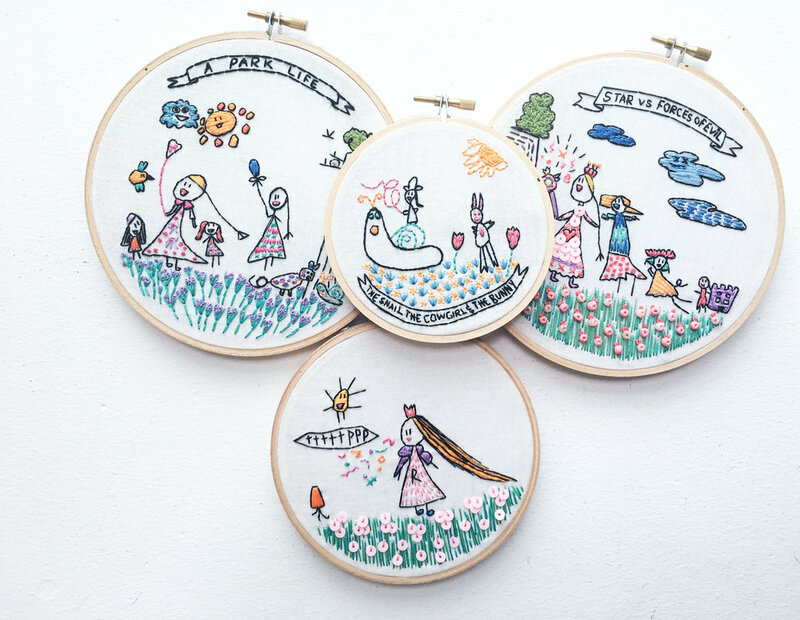 Below are some of her favourite stories and drawings that I’ve recreated in embroidery. 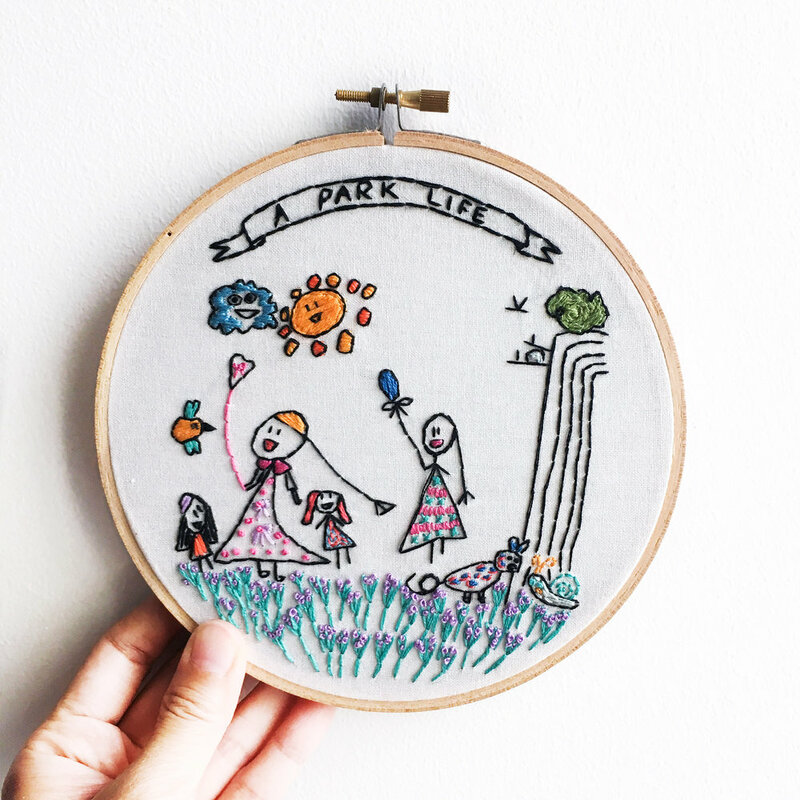 ‘A Park Life’ is about a kind princess having a fun and magical day with her friends in the park. Even the sun, clouds, animals and birds come to life. A beautiful day, Mr. Sun is being silly. This is inspired by the cartoon series that Miya enjoyed during a family vacation in Tokyo. Rapunzel was out in the park having a nice stroll when she met a talking carrot. She muttered in a strange language to the carrot. No one knows the secret language. They will take over the world. Princess R and her friends are reaching out to the magical sky! Princess R says ‘Abracadabra!! ‘Twinkle twinkle little stars, Princess R is on a mission to save the world and enjoy a midnight feast with her friends at the palace. 'If Dinosaurs can talk, they should all hang out in a cafe!' said Miya. From top left, Parasaurolophus is playing a tune with his crest. Rainbow T-rex is practising yoga ( ohmn..). The rest of the dinosaurs are hungry. Dinosaurs are friends with humans too. All Illustrated by Miya and thread by me. "Im the Big Bad Wolf!" Argh...Run!. This is Miya's version.